When a Private Ticket needs to be converted to a Regular Ticket. The same ticket needs to be created for different contacts. To just replicate the ticket details for your own varied requirements. Please note: Only the initial message from the original ticket will be carried over to the cloned ticket. 1. Open the ticket you want to clone. 2. 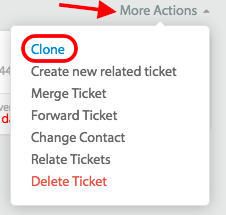 Click on More Actions on the top-right of the ticket details page and then click on Clone. 3. This will automatically redirect you to the New Ticket form where you can clear/enter any additional fields and create ticket.